Poll: How did you find my mod? How did you find my mod? 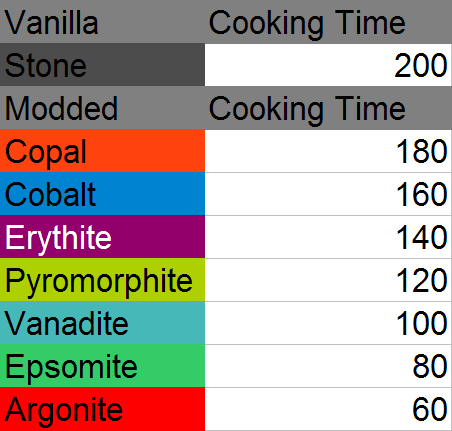 This mod adds 12 new ores Copal,Cobalt,Erythite,Pyromorphite,Vanadite,Epsomite and Argonite which you can all make into tool sets, shears, armor, ladders which are faster than vanilla ladders and furnaces which have faster cooking times. Sulphur is a utility ore which can be made into sulphur soup or eaten by its self but you will only gain 1/2 hunger it is also used as the fuel for the new furnaces. The Sulphur Soup gains 3 hunger and is made with 1 Sulphur Dust and a bowl. 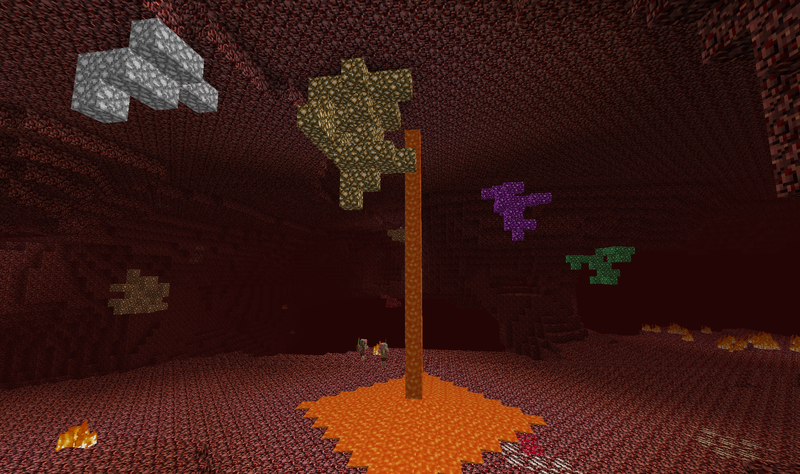 There are also 2 new nether ores FireStone and BloodStone. 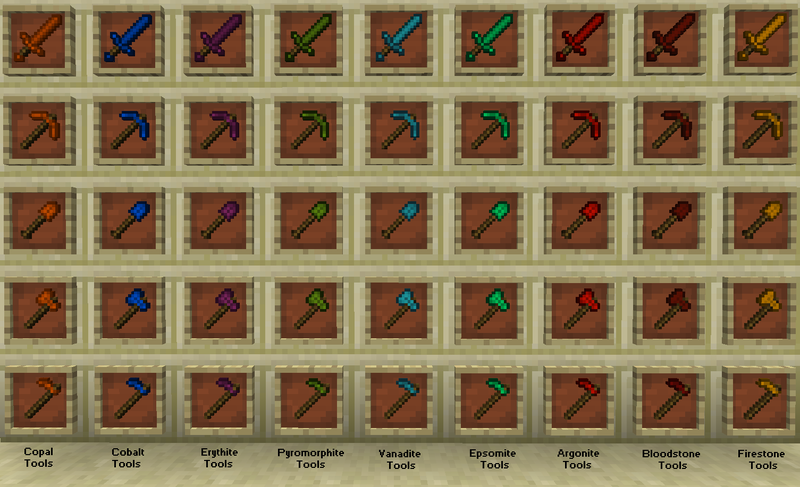 BloodStone and FireStone can be made into tools, shears and armor. There is also 1 new ore called Fluorite Ore. This ore can be made into coloured versions of it by surrounding a dye with fluorite crystals which can be made into coloured torches. There is a new ore called Jet which currently can be smelted but has no use yet. Another feature is Coloured Glowstone which generates in the nether like vanilla Glowstone and can also be made into coloured lamps. All the ores have storage blocks. Most recipes are the same as vanilla recipes. If you would like me to keep updating I would greatly appreciate your donation. 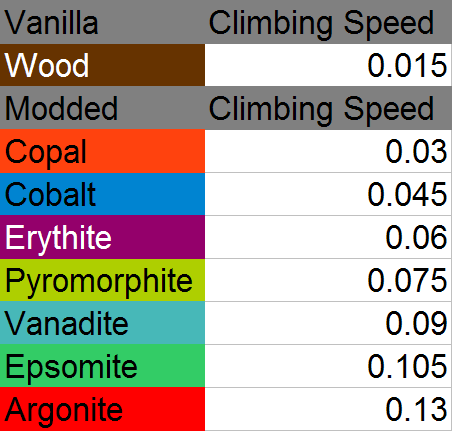 This is the climbing speed of the new ladders. This is where you find the coloured glowstone! 3.6 - Fixed naming issue with Copal Ore.
3.5 - Updated to version 1.6.4! Added so many new features see pictures for all the new items and blocks! 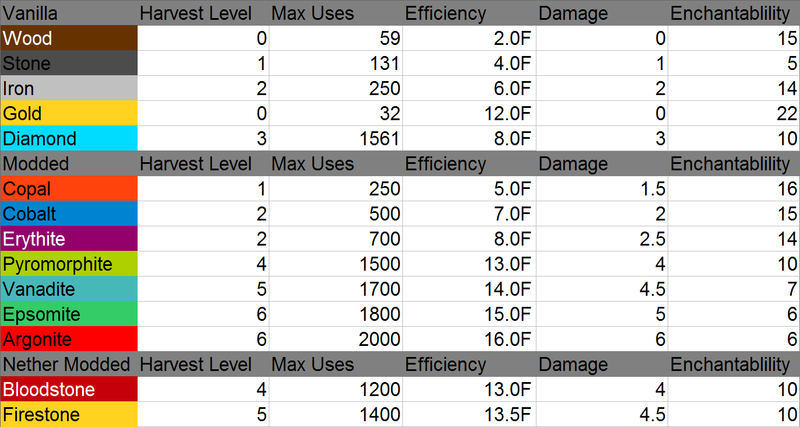 2.0 - Updated to version 1.6.2! And fix the bug where you could mine Vanadite with Copal! 1.2 - Updated to version 1.5.2! hopefully ill make a furnace with it if not ill find another use . Beta 4.0-Updated To minecraft 1.3.2, Bug fixes, Added New Ore called Vanadite! Beta 3.0- 4 new ores Aqua,Purple,Green,Orange Fluorite.- The four ores drop the coloured shards.- The colored Shards can be made into colored Torches.- Minor bug fixes.- Sulphur Dust can now be used as a Fuel in the Furnace and last 32 blocks! Beta 2.0-Two new ores in the nether FireStone BloodStone.-All tools for the new ores.-Small compatibility issues with other mods. Beta 1.1-Pyromorphite is now much Rarer-Sulpur soup is now crafted with Sulphur Dust Water Bucket and Wooden Bowl-Sulphur now drops more then one-Fixed the tools been so weak-Added Armor-Armor is enchantable-Tools are still not enchantable-Fixed some bugs- Copper is now called Copal. If you want to make a vid that would be great! Please also comment what you think! So what are the durabilities of these tools ? Write some info..
Hi, its just an aesthetic mod or new minerals have diferents force and durability? Would be helpfull some kind of description table. What would make people want to download this mod that adds a handful of new ores and tools over another mod that adds a handful of new ores and tools? Different how? Colors and names don't make ores different and there are other mods that add ores to bridge the gap between stone and iron, iron and diamond, and a rare ore to give progression past diamond. What's sulfur soup do? Is it food? How is it different from a porkchop or bread, other than it comes from an ore? Like i said this is my first mod to get me going for more mods. If you have down loaded the mod please post feed back it would be epic and please tell me any bugs! Just like a Simple Ores Mod... Not very realistic but I'm not a hater or staring a fight it's still a nice mod! Thanks man you are EPIC!